Our flight got in at around 8:20am and we caught our hotel’s complimentary shuttle at 9am. 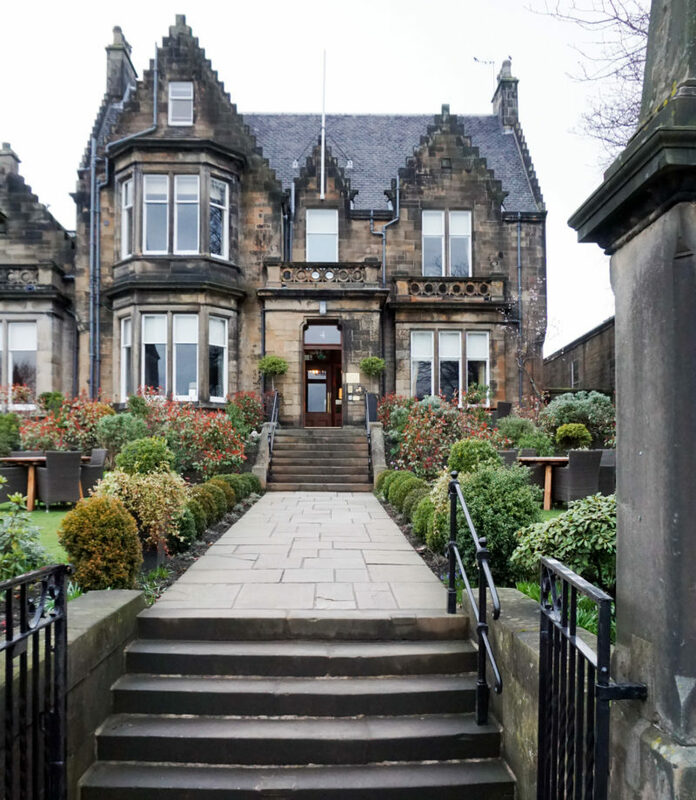 We stayed at the Apollo Hotel (using Starwood points) and while it was okay, I probably wouldn’t stay there again. More on this in a minute. We checked into the hotel and took the tram to the main train station, as the concierge recommended it as the best rate for currency exchange. It took us about 30 minutes to get there, but we needed to be in the area for our 1:30pm walking tour and I’d researched this incredible looking lunch spot that was nearby. We headed to the café (Gartine) after exchanging money and unfortunately despite it being 11:15 on a Friday, there wasn’t a single table available. It’s a tiny spot and is popular among locals, so either make a reservation or go right when they open…we tried again on Saturday afternoon and it was also completely full! So on Friday, we ended up grabbing lunch at this pretty standard/average café (my omelette was actually delicious, albeit overly greasy…I was just bitter and wanted to go to Gartine) but washed it down with a tremendously delicious chocolate + white chocolate stroopwafel from van Wondren–you pay for the novelty of their creations but it is so worth the couple extra euros. After filling our bellies, we made our way to the National Monument to meet up with our tour group. Per Diana’s recommendation, we opted for a free Sandeman’s walking tour and I seriously could not recommend it more. Our tour guide was hysterical and so good…her name was Lisa and she actually also has her own tour company, if you’re interested. We can thank her for singlehandedly making sure we powered through jet lag because her knowledge and wit made the three hours fly by. The tour ended by the Anne Frank house and we walked the 45 minutes back to our hotel before our 6:30 dinner reservations. The main reason I was meh about our hotel was that it was just too far from the city center–I love walking and will frequently walk two miles to get somewhere in DC, but having that long of a walk meant we never stopped by our hotel during the day to drop things off, get changed, etc. This was bearable since we were only there for three days, but for instance, on Saturday, we’d shopped some and were in touristy clothes but wanted to go to a couple bars and just felt weighed down by our bags etc. The hotel staff was incredibly nice but to be honest, the rooms weren’t that clean (this is something I take insanely seriously) and the shower was so modern (literally a three foot long piece of glass as a “barrier”) that I’d soak the entire bathroom within five minutes. Next time, the furthest from city center I’d stay is by the museums–there are a bunch of hotels there and you’re still outside a of the hustle and bustle but more conveniently situated in general. Everyone says Amsterdam is small and completely walkable and I definitely think that’s the case if you’re staying a little closer to city center. 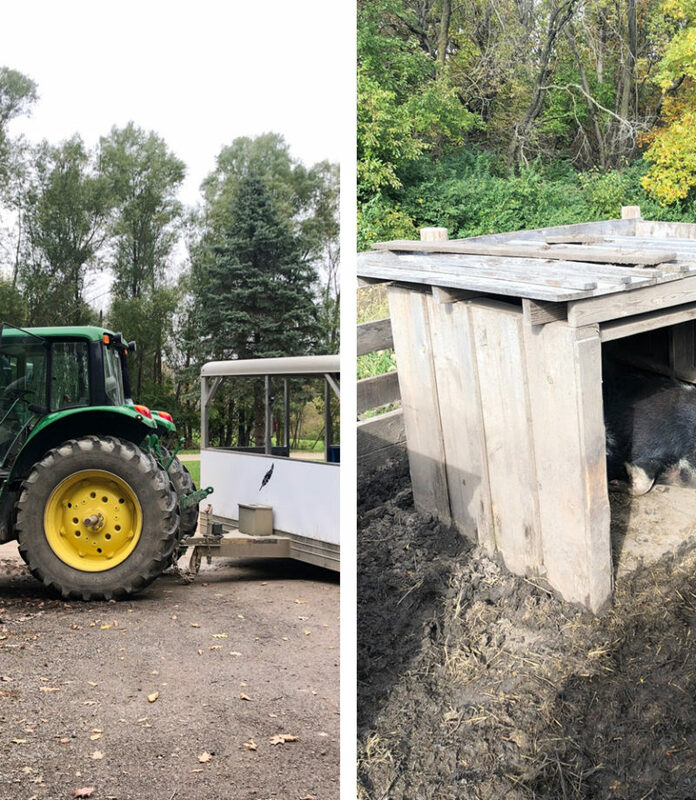 One of the perks of where we stayed, though, was it’s proximity to a couple more “off the beaten path” places we wanted to visit (Note: they just weren’t in city center and were in more residential neighborhoods.) Indonesian food is extremely popular and acclaimed in Amsterdam, due to Indonesia formerly being a Dutch colony. 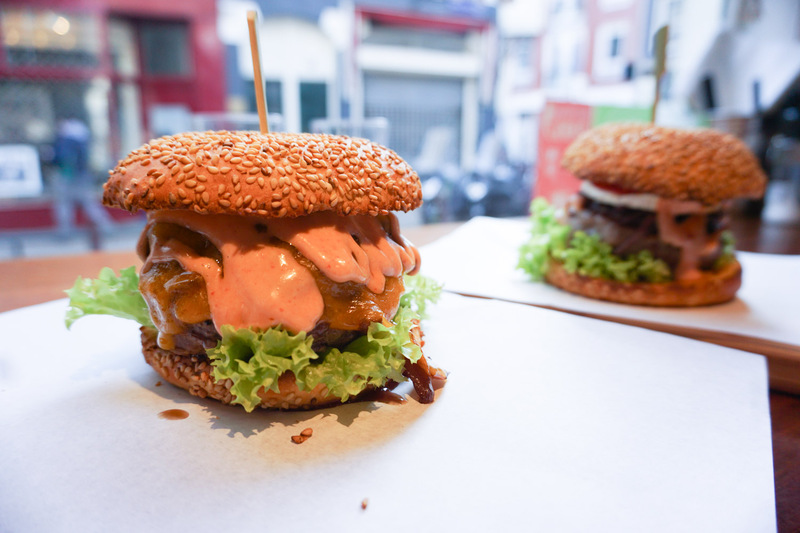 Following their independence, many Indonesians moved to the Netherlands and brought with them their cuisine–which is why there are both so many Indonesian restaurants in Amsterdam. 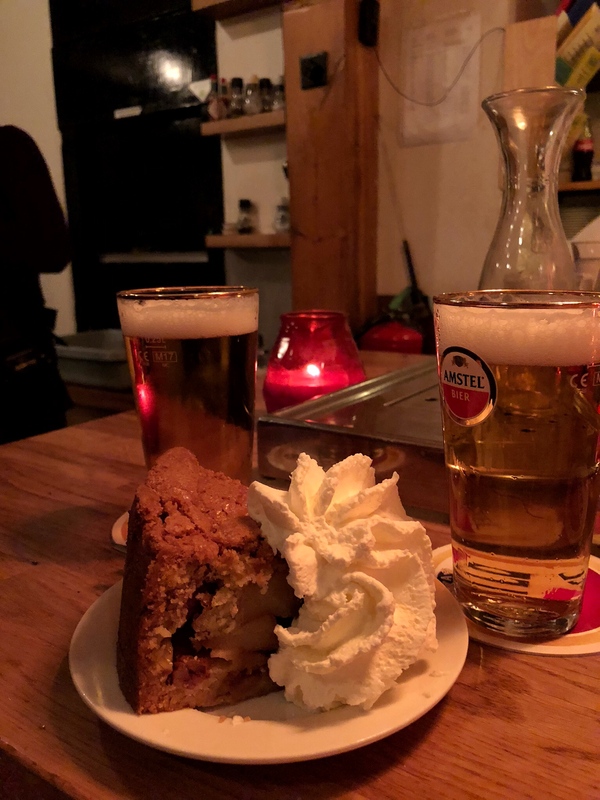 I discovered Restaurant Blauw in my research and booked dinner there Friday evening so we’d be forced to stay up till a reasonable hour. The food was incredible. 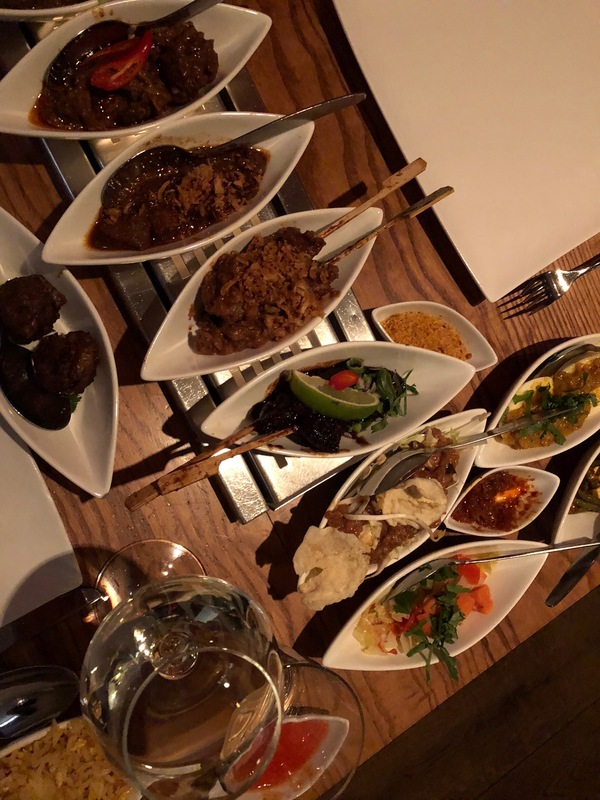 If you ever have the opportunity to try Indonesian good, don’t pass it up–we had the rijsttafel, which translates to “rice table,” (think of it like tapas) and it was the best way to sample the cuisine even though we didn’t know what most of the dishes were. 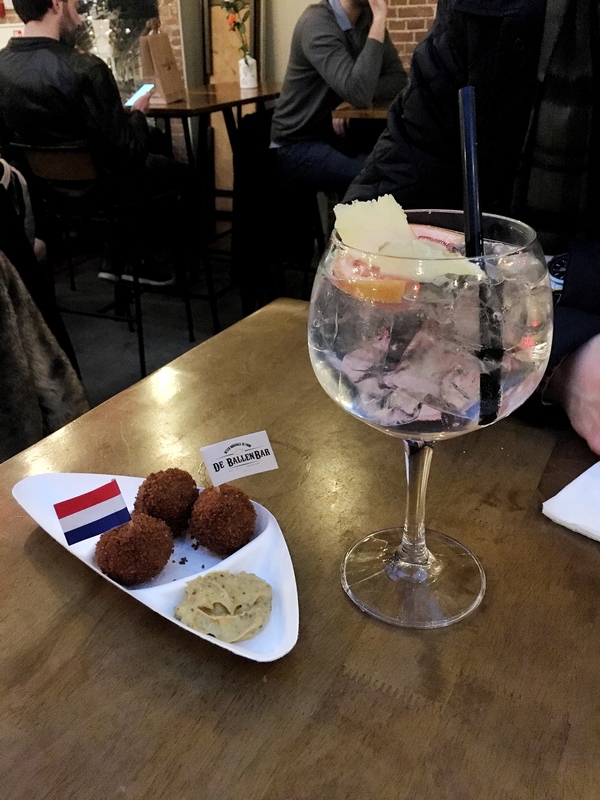 I truly cannot recommend Restaurant Blauw enough…it was about a 30 minute walk from our hotel in what felt like a more residential area and we took an Uber back to the hotel around 8:45pm. It was a perfect ending to the best first day! I literally don’t know how I managed to botch an iPhone photo this badly but I wanted to share what our Indonesian dinner looked like–we had about 15 of these little dishes (as part of a rijsttafel) to share and it was the perfect amount of food for two people. An early wakeup call–we were out the door by 7:45ish, as we wanted to catch the city before it really woke up. 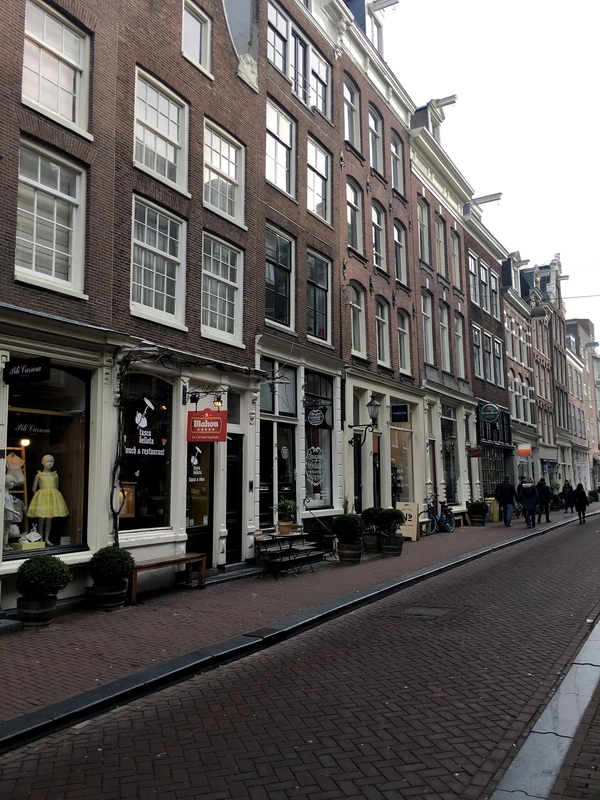 The streets were nearly empty and we wanted to get to The Pancake Bakery early, as it’s located right by the Anne Frank House (read: an area regularly overflowing with tourists). 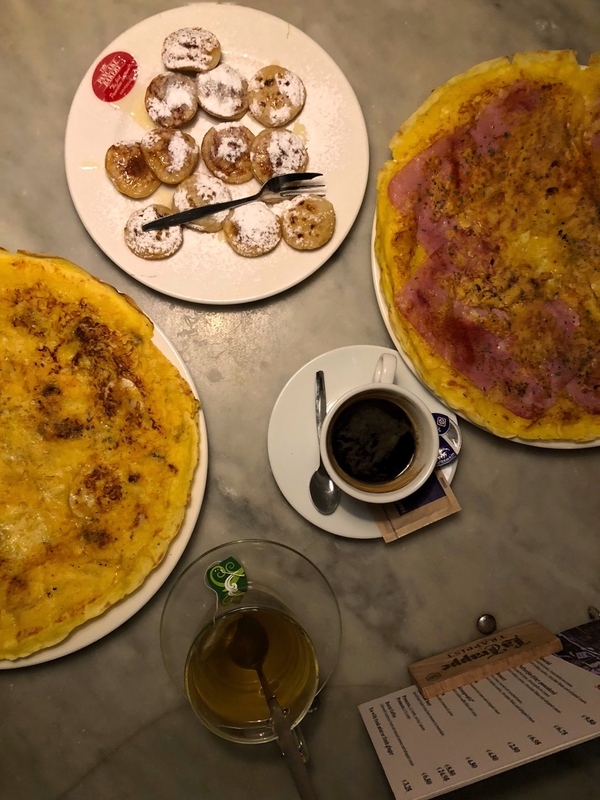 Our tour guide had told us to stick with the savory varieties for the authentic Dutch experience, so we each ordered one–mine was cheese and mushrooms, J’s was ham and cheese–and shared the traditional poffertjes for something sweet. Both completely hit the spot…we really ate so well on this trip! Honestly, the place was pretty packed with tourists (literally people arriving with suitcases since flights from the US typically arrive in the morning, and we also noticed that a lot of people arrived early Saturday morning, presumably from other European cities, to spend two full days there) but the food was delicious, the prices pretty reasonable, and the service excellent. We got there around 9:45 and didn’t have a wait, but it got busy quickly after. Not the best photo, but I had to include it–these pancakes were literally EVERYTHING. What I would do to eat them weekly! After breakfast, we spent some time walking around the nearby area before our 12:15 tour time for the Anne Frank House. 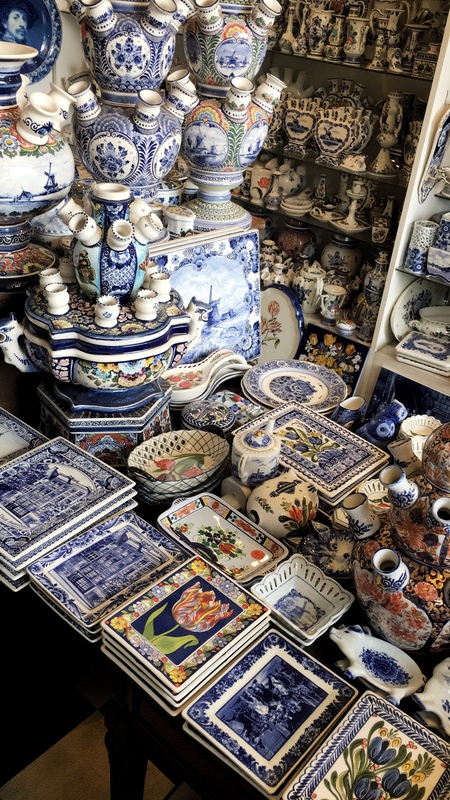 There are so many beautiful cafes and shops, including this one that sold so much Delftware–you know I was in heaven! The vases on the left are actually designed specifically for tulips, and I wish we a) had space for one in our luggage, b) had space for one in our home, and c) regularly bought tulips to justify taking one back. 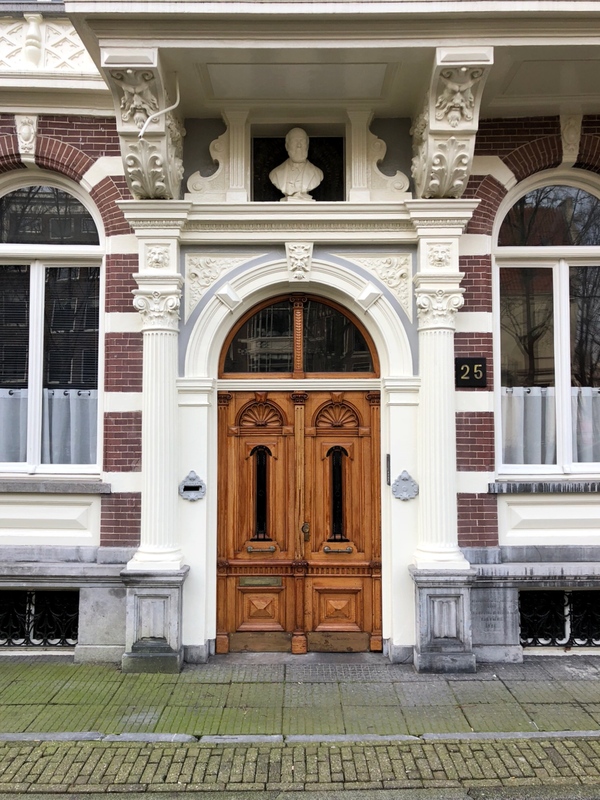 If you’re planning a trip to Amsterdam, definitely try to get tickets to the Anne Frank House. While it’s essentially a museum at this point, it’s very well done and a moving experience. Buying tickets online is currently the only option due to some construction that’s taking place, but it’s really easy to do as long as you plan ahead. The tour lasts just over an hour. After our tour, we headed to the Waterlooplein Market, a flea market that Lisa had mentioned the day before. I love a good flea market and while a lot of stuff was kind of junky, there were some pretty antiques and a local vibe. 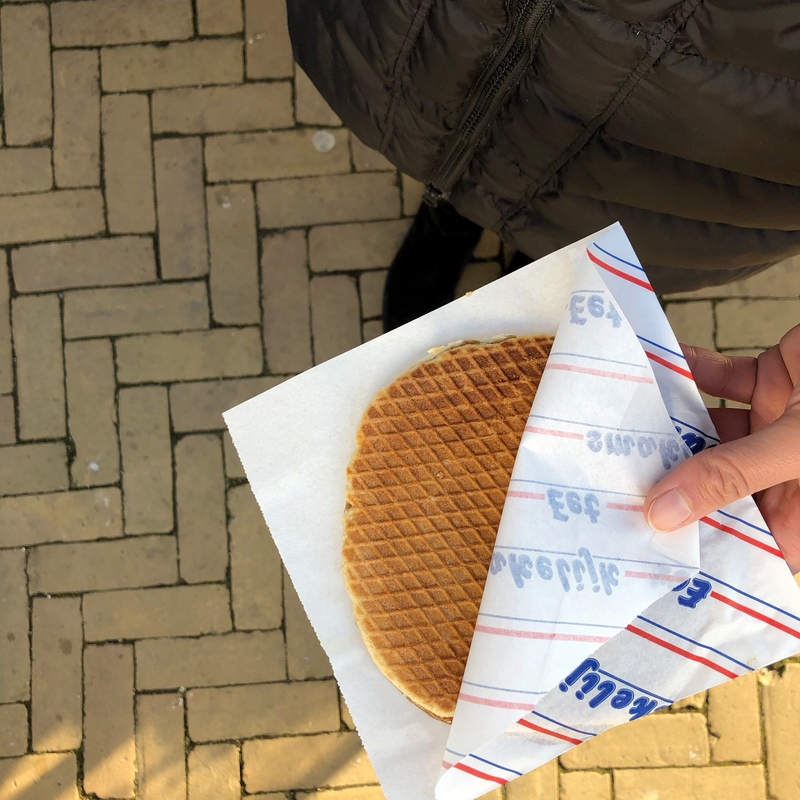 We picked up a stroopwafel on our way…I could seriously eat one or more a day. A random thing to note…the hooks you see at the top of all the buildings are designed to hoist furniture and belongings into the windows below. Since the facades and stairways are so narrow, this is how people move things into their homes…we actually saw people utilizing it to move a couch into the top window of an apartment in the middle of the Red Light District on Saturday night (pretty poor time to have furniture delivered, but to each is own). The buildings also slant slightly forward at the top so whatever is being pulled up won’t hit the front of your house. One of the coolest things we learned about the city! We eventually made our way to La Perla Pizza for an early dinner since we skipped lunch. Ashlee recommended it and it turned out to be a great place to warm up after a few hours of walking outside. We spent the rest of the evening walking some more, popping into Primark (I got a really cute coverup…#seasonallyappropriate), walking through the Red Light District (we’d passed through on our tour on Friday as well, and I’d recommend doing so if you can, as it’s a really interesting part of the city; our tour guide gave a good background on Friday and most tour groups seemed to do the same) and ended the night at Cafe Winkel. They’re known to have the best apple pie in the city and OMG, you guys…it was probably my favorite thing we ate on the entire trip. We got there around 8pm and it was busy but not packed; we snagged two seats at the bar and I wish we hadn’t been so tired and could have stayed for a couple hours because it was the coziest little spot. Our boat captain on Sunday (more in a sec) actually said it’s locally renowned, too, which was nice to hear! Literally the best apple pie I have ever (and likely will ever) eaten in my ENTIRE LIFE. My only regret of this trip is not going back to Cafe Winkel for seconds or taking another piece to-go. 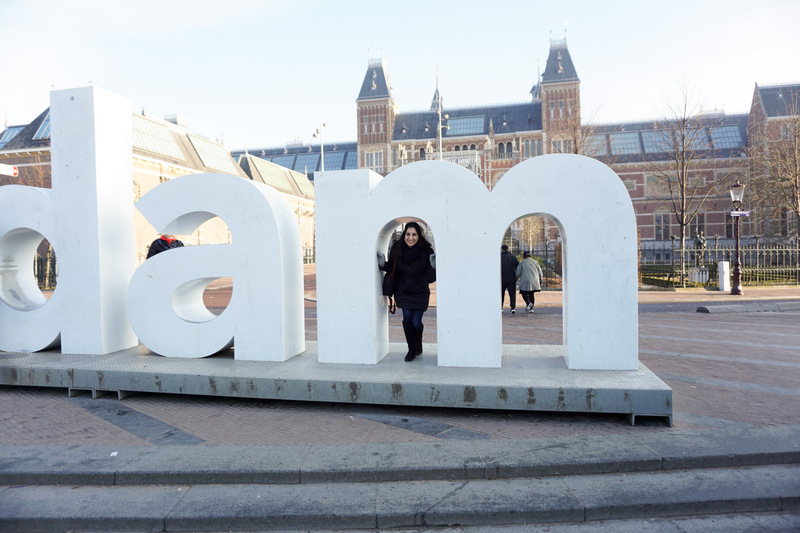 After two 12+ hour days, we were surprisingly fairly energetic and headed to the I Am Amsterdam sign around 8am. Unfortunately it was already pretty busy, but still really cool to see in person. We had 9:45am tickets to the Van Gogh Museum that’s practically next door. 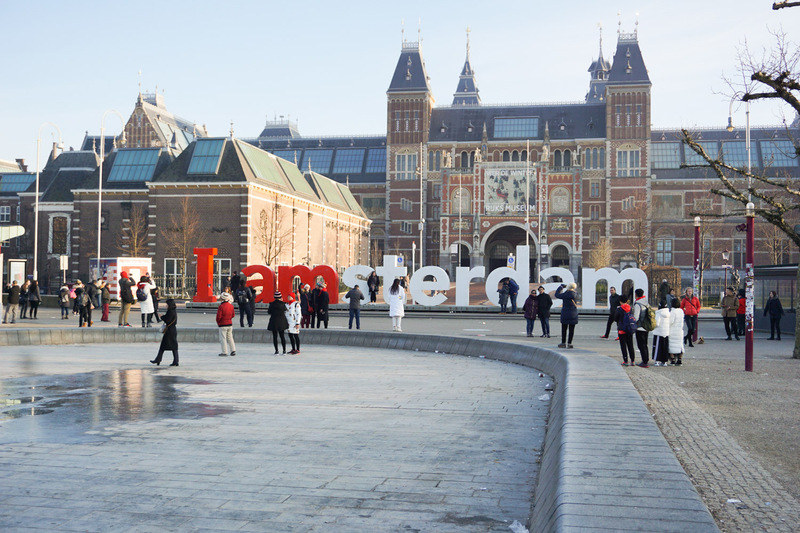 The building behind the sign is the Rijksmuseum, which we definitely plan to visit next time we’re in Amsterdam. The Van Gogh Museum was really interesting (skip it if you aren’t a big Van Gogh fan, though, as it’s all him and his contemporaries) and our next stop was Lombardo’s, which allegedly makes some of the best burgers in the city. The space is tiny and we’d walked by on Friday and seen it packed, so we got there about 20 minutes after it opened and were the first people in for the day. Highly, highly recommend stopping in for a [messy] casual meal. You guys know how much I like burgers and this one easily made my top 10. After lunch, we I did a little shopping at Petit Bateau (some of the best stripes!) and Longchamp before we stopped into a grocery store to pick up a bottle of wine before our canal tour. We used Leemstar Cruises (another rec from Ashlee!) and it was the best. Our guide was local, there were only 11 of us on the boat and it was nice to be on a semi-private one vs. on one of the much larger, touristy boats we saw passing by. Pro tip: bring your own drinks + snacks! 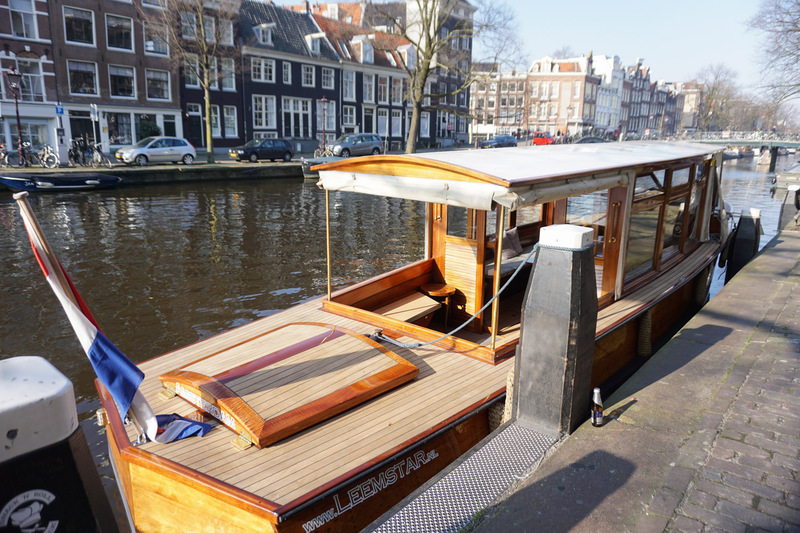 Post-canal tour, we walked around some more (and picked up a beautiful antique Delft vase!) before heading to Foodhallen, which is basically a large space with several food vendors (similar to Union Market, if you’re in DC). It’s outside city center but is buzzing with locals and is something different if you’re looking to explore a new neighborhood. We shared a few random things and called it dinner…bitterballen (mentioned here! ), a gourmet hot dog, fries, a couple pastries, and a massive grapefruit + ginger gin and tonic. It was a fun place to rest our feet and hang out for a couple hours before stopping at a nearby grocery store to stock up on stroopwafels and cookies to take home. 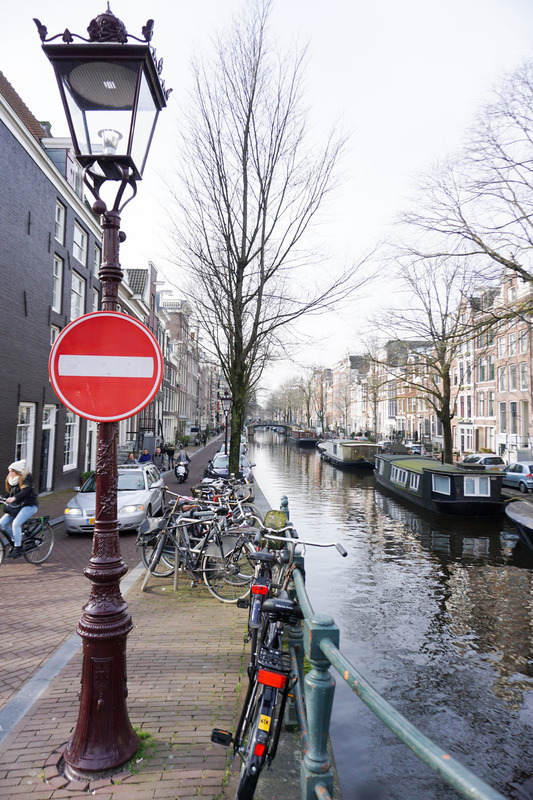 Phew, that’s a recap of our three packed days in Amsterdam! A question I’ve been getting a lot is about what it was like to travel there for such a short trip. Honestly, it wasn’t bad at all…we’d found direct flights on United out of Dulles via Scott’s Cheap Flights and our flights were on time. There was obviously the risk of delays but if everything goes as planned and you power through jet lag on day one, it’s completely doable! 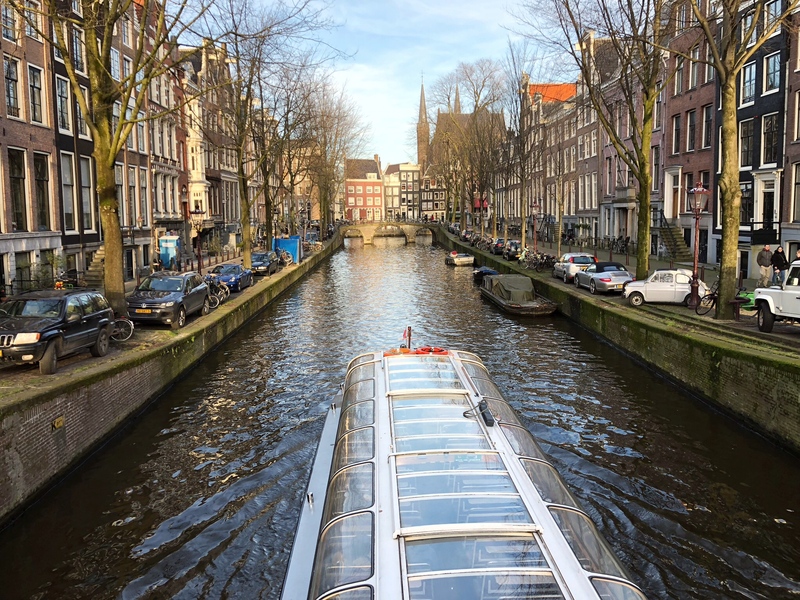 We loved Amsterdam and can’t wait to go back in the warmer months–it was in the 40s pretty much the whole time but you definitely feel the wind more due to the canals. We also got incredibly lucky, as it typically rains a lot but didn’t shed a drop for the three full days! Let me know if you have any specific questions about spending 3 days in Amsterdam (in the comments below or at monica@monicadutia.com). 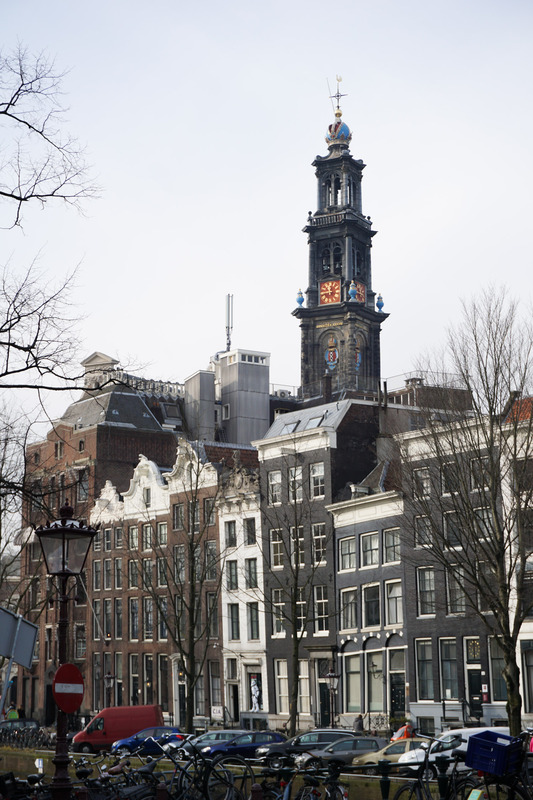 And trust me, plan a trip to Amsterdam–evennnn if it’s just for three days–you won’t regret it! Yay! So glad y’all enjoyed the city! Y’all packed in SO much over 3 days! Glad y’all loved the boat ride as much as we did. Making me want to plan another trip back! Your recs were wonderful!!! I’m so glad we did that boat ride and didn’t go with any other company. The best experience! 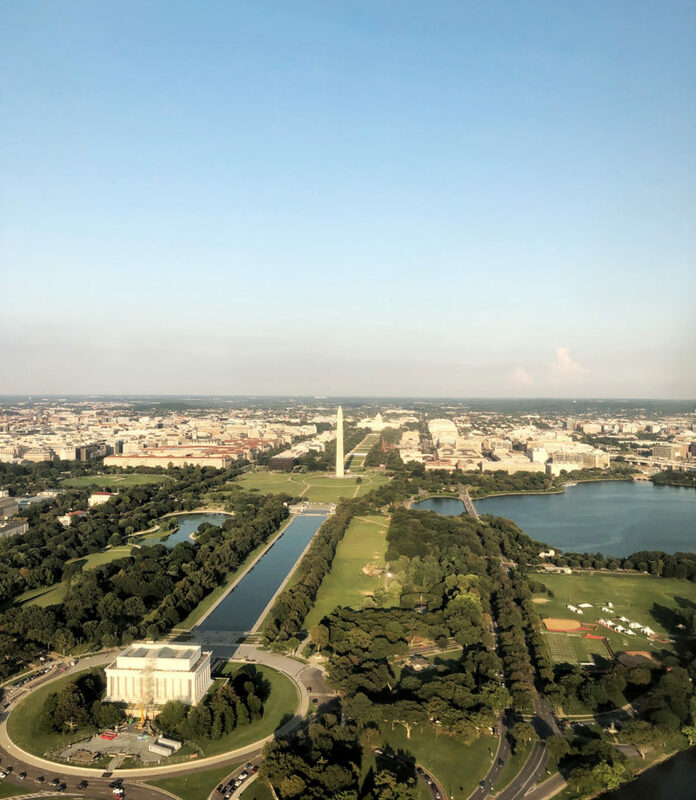 I’ve never even thought about jumping on a cheap flight to Europe for a long weekend, I always feel like I need at least a week, but now you’ve totally changed my mind! It’s crazy how easy a [non-delayed] direct flight makes it! Definitely makes you want to take advantage of as many Scott’s Cheap Flights deals as possible! Ah so glad you guys enjoyed the tour! I love doing them in new cities. 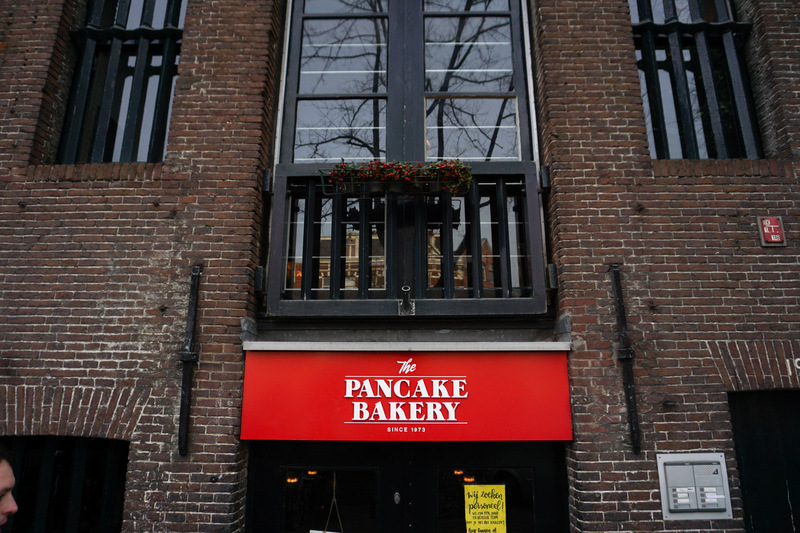 And the Pancake Bakery… I still remember those pancakes! 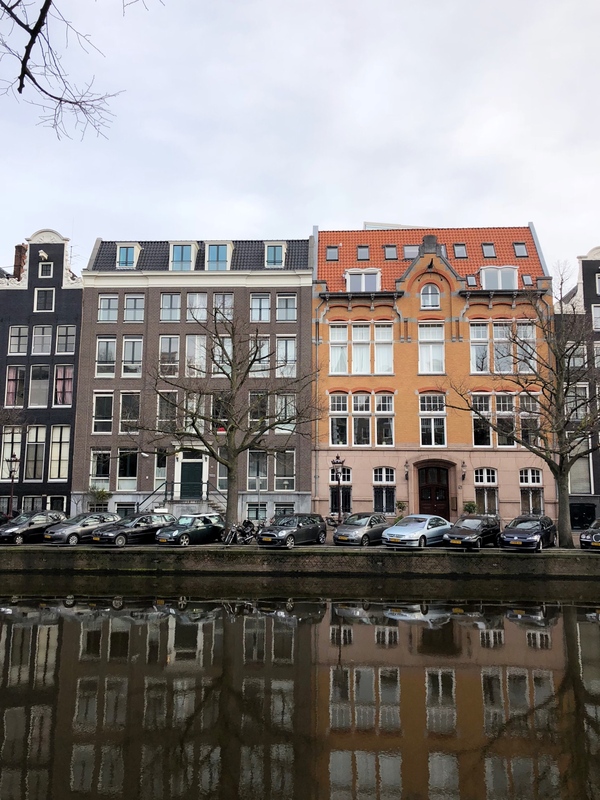 I visited Amsterdam when I was studying abroad and it was one of my favorite cities, but this post makes me want to go back! It’s such a lovely place with tons to do. I also really want to do to a long weekend in Europe now! Such a great idea.